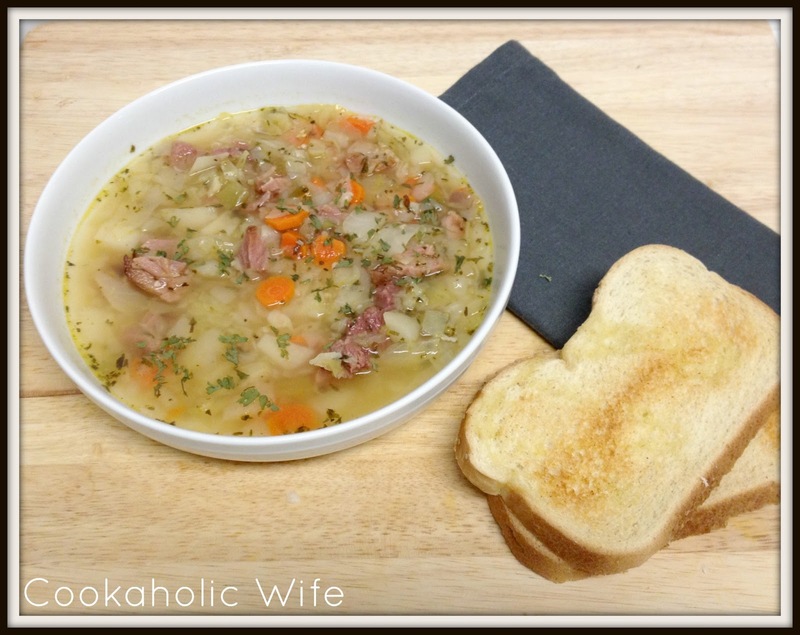 When I saw this recipe in Cooking Light, I was immediately drawn to it and wanted to make it right away, however it took forever for me to get to the farmers market to purchase a ham hock. For some reason, I didn’t even see on at Wegman’s and ended up finding it at the Amish Farmers Market down the street. However, once I had this recipe on the menu, I had a hell of a time trying to find the ingredients. The store was out of leeks and turnips. Instead of searching around at other stores for them, I decided to just omit them, but I’ve left them in the ingredients since I hope you’ll have better luck than me. To save time, I also opted to use canned beans although the recipe calls for soaking fresh ones. 1. Heat the olive oil in a large stock pot. Add the onion and cook for 8-10 minutes or until soft. Then add the leek and garlic, cooking 2 minutes more. 2. Add the stock, potatoes herbes de Provence, beans, ham hock, carrots, turnips and bay leaf. Bring to a boil, then cover and reduce heat to low. Simmer for 40-45 minutes or until the potatoes and carrots are soft. 3. Remove the ham hock, discard the bones and return the meat to the pot. Stir in the remaining ingredients and cook for 5 minutes. 4. Serve hot with toasted garlic bread. I cut the cabbage way back in this soup since the initial recipe calls for 4 cups which I thought would completely overpower the soup. I really enjoyed this and thought it was really tasty. Tom wasn’t a fan which surprised me since he likes all of the ingredients otherwise.